The term “FBO” refers to a Fixed Base Operator. This is an airport business which handles private aviation (non-commercial), aircraft passengers and services. Usually, it is a stand-alone terminal at an airport like you will find at Luxivair SBD. Fixed base operations came into law with the enactment of the US Air Commerce Act in 1926. Before that time non-commercial aviation businesses were mobile and transient, moving around the country at will depending on the seasons and local interest in aviation. With the Air Commerce Act, aviation support businesses were regulated for maintenance and training standards and began to have a fixed airport address, leading to the term Fixed Base Operator. 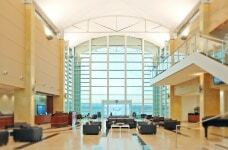 In the past and for smaller airports today, the FBO may manage all airport passenger operations. FBOs today are often themselves a destination, with advanced services and technology to meet the needs of discriminating clients. Such is the case with Luxivair SBD. Our fixed base operations include a state-of-the-art terminal facility with luxurious appointments for passengers, technologically advanced flight planning facilities for aircrews, conference facilities, an on-site concierge service, and much more. We have full-service aircraft fueling and maintenance available, baggage handling, on-site Customs clearance, and aircraft hangers and tie-downs for customers staying in Southern California. If your travel needs include Southern California and you desire to avoid the hassles of congested Los Angeles airspace, choose Luxivair SBD as your Southern California FBO and let us pamper you when you arrive.